A fictional account of the Greek financial crisis. 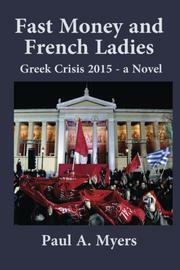 In this novel, Myers (Betrayal in Europe, 2015) blends wholly made-up characters—financial wizards Jim Schiller, Jack Hawkins, and James Smith; behind-the-scenes fixer Sophie d’Auverne—with fictional versions of the European leaders who were in the headlines as Greece struggled to meet its financial obligations and maintain its place in the European Union in 2015. (Those officials include Angela Merkel, Christine Lagarde, Mario Draghi, and Alexis Tsipras.) Sophie jets from one financial capital to another helping to arrange a deal that will head off financial chaos, while her fiance, Jim, sets out on his own damage-control mission after realizing that his hedge fund has gotten involved in risky Greek investments. Jack and James decide to bring the monarchy back to Greece, regardless of the elected government’s preferences, and everyone is spying on everyone else, hoping for an edge. In the end, a deal is reached, the financiers continue to make money, and reporters continue to pay more attention to Yanis Varoufakis’ motorcycle than to his country’s financial policies. Sophie, the story’s core, is always ready with a snappy comeback (“That’s my helicopter. Yours is the little one out on the horizon”) or a politically astute move. Balancing her professional obligations with keeping her teenage daughter in line and living up to her aristocratic family’s standards, she always remains thoroughly French. The other characters are people who use terms like “Grexit” in casual conversation, and their stories will appeal to readers who are similarly devoted to the machinations that surround global finance. Those same readers, however, may find the repeated explanations of the novel’s real-life characters (“mentioning the powerful German finance minister, Wolfgang Schäuble, the number-two politician in Angela Merkel’s ruling coalition government”; “referring to Yanis Varoufakis, the Greek finance minister with the rock star reputation”; “referring to Christine Lagarde, the head of the International Monetary Fund”) superfluous. Yet the novel is fast-paced, with an intriguing plot (even for those who already know the outcome), and Myers demonstrates that a financial story can be a thriller even without a single drawn gun or weapon of mass destruction. An enjoyable novel based on a piece of recent economic history.